Training: What is it All About? Take a piece of paper and describe the last training session you conducted, observed, or attended. What happened? Who did what? What did the staff do? How about the participants? What did they do and what kind of capabilities did they acquire? In your description try to be as specific as you can possibly be. Compare your description with my account of two training events presented below under Program "A" and Program "B". Reading these two programs you will find that the topic and context of these two training events are alike; the ways the events are conducted, however, are very different. It is this difference which constitutes the basis of my examination, and it is the analysis of this difference which will help me to answer the question stated in the title: Training: What is it all about? I will describe the two programs based on the questions I have asked in the introductory paragraph. 1 In the training area, charts are displayed with planning slogans. As the participants arrive, they are seated and the staff in charge explains the program of the session. The day before, the written objectives of the session are distributed and participants are asked to modify them to fit their own interests and needs. The night before the session, teams of 5 to 6 participants are asked to prepare a plan for their hike which will take place during the last day of the course. 2 The staff presents a skit in a humorous vein - about two trainers who forget to plan ahead. The moral of the skit is brought out by the staff in charge who lists reasons why we should know how to plan. Upon arrival at the session, participants first individually, then in teams, are asked to list those aspects of their training responsibility which call for competence in planning. Teams report their lists to the entire group and a master list is developed. Motto Tell them why! Discover why! Next, teams exchange and evaluate each other's plans which they prepared last night and share their findings. 3 The staff, using a flip chart, delivers a presentation on steps of good planning. Trainees are asked to take notes. At the end, questions are answered by the staff in charge. Teams are asked to describe steps of good planning. They review a programmed filmstrip on: "Guide to Planning". The program requires individual and group responses and it has built-in quizzes. It leads participants to develop a scheme for planning, which they compare with the one they earlier developed and resort their findings. Motto Tell them! Exposure to how to evaluate planning. 4 In support of the main presentation and to demonstrate steps of good planning, a motion picture is shown to the group on a planning session. Teams now rewrite their original hike plan, exchange plans and evaluate each other's plans, and prepare their revision of the plan. Teams evaluate the competence. gained during the session against the stated objectives and report on their findings to the group. 5 The staff highlights the teachings of the film and questions on the film are answered by a panel of staff. Teams prepare a set of questions for general discussion. questions presented are answered by the participants and by the staff. 6 The staff in charge presents a summary of the session. Teams are asked to choose one aspect of the session and prepare a summary on it and present it to the whole group. Motto Tell them what you told them! Teams reveal what they learned. 7 The staff challenges the group to follow steps of good planning in all their future programs. Participants prepare their own planning objectives for the next six months. Following the session, individuals discuss their objectives with their counselors. 8 The notes taken by the participants during this session will be evaluated by the staff. The reports of the participants on the attainment of their six-month objectives will be the basis to evaluate the success of this program. The staff explained the program of the session, put on a skit on planning, and presented reasons why one should learn to Plan. Next they delivered a lecture on good ways of planning, demonstrated planning by presenting a film, answered questions, and summarized the session. Finally, they evaluated the trainees' notebooks. It was indeed a busy staff! During the project the staff coordinated the inter-team activities, took care of the programmed filmstrip presentation, managed the question-answer and summary periods, and worked with the teams as resource personnel. The staff really did not seem to do too much during the session. What Did the Participants Do? Participants, upon arrival at the training area, were seated. They listened to the presentations and took notes. Twice during the two-hour session two or three participants asked questions. Compared to the staff, the participants really did not do much. Participants studied the project objectives, modified them to meet their own needs and planned for their hike. Upon arrival at the session, they listed reasons for learning how to plan, compared their lists with others, and developed a master list. Teams exchanged and evaluated their hike plans and developed a planning scheme and modified it based on the filmstrip. They revised their hike plans and evaluated each others plans, prepared and answered questions, summarized and prepared long-range objectives for planning. Participants were always acting, doing something during the project. What Capabilities Did the Participants Acquire? From their notebooks we know that they took notes during the session, but we don't really have any other evidence as to what they have learned, except that they sat for two hours, and a few of them asked some questions. They can work with objectives, can evaluate performance against objectives and can prepare objectives of their own. They know why planning is needed. They can prepare plans according to a planning guide and can evaluate plans for correctness. They can develop long-range planning objectives. They can also work in teams. Now compare your account of a training session with the two descriptions above. You will find that the program you described is probably similar to one of the two. I suspect that it will be more likely "A" then "B". Let us go back to the two examples I described and examine them. Reread example "A". What characterizes this program? Then read "B" and ask the same question. What did you find out? Let me share with you my findings. 1 A course syllabus is available which outlines the session and which guides the performance of the staff. Performance objectives are prepared and individualized which clearly state what the participant will be able to do and know at the outcome of the project. These objectives guide the activities of both participants and staff. 2 The teaching plan is developed by the staff as an implementation of the syllabus. It is determined what has to be learned by the participants to enable them to perform the way described in the objectives. 3 Presentations, lectures are prepared and visual aids selected to support the teaching program. Learning experiences will be selected which will ensure the experience needed to master specific learning tasks. 4 Subject matter is presented through instruction or demonstration Much of what is to be acquired is discovered by the learners themselves and is learned by them as they accomplish things during the project. 5 The staff conducts training sessions with the whole training group. The program is conducted in large and small groups or on an individual basis in settings which are best suited for the attainment of learning tasks. 6 The group of trainees sits, listens, and takes notes. Members of the staff are actors on the instructional scene. They control the training group and furnish directions and information. The individual is involved actively and intensively as an actor on the learning stage. The staff is involved in managing the learning environment and in setting the stage for learning in order to facilitate the success of the learner. 7 The progress of the training group is evaluated by the staff. Progress is dependent mainly upon self-direction and self evaluation. Participants assume responsibility for their own learning. Summary Teaching is in focus: the trainer is the actor and the trainees are the audience. Learning is in focus: the trainee is the actor; and the trainer becomes the manager of learning. The two descriptions above present two contrasting modes: the teaching focused, and the learning-focused training modes. These two modes can be represented by two contrasting diagrams. Training Mode "A" can be depicted like the diagram below. Arrangements are made in the environment of the learner which communicate to the learner the learning task so that he can explore and master it. Learning tasks are knowledge, skills, and attitudes which the learner is to acquire in order to be able to perform in the way defined in the objectives. In Mode "B" the singular form "learner" is used. It is the learner who is the actor on the scene and arrangements are made around him in order to help him to master his learning task. "Arrangements" as a term stands for a lot of things, such as the selection and organization of learning experiences by which the learner is confronted with the learning task; the management and motivation of the learner; the assessment of the progress he makes; the selection of people and other resources which take part in the arrangements; scheduling, etc. (In an extreme form of Mode "B" all these things can be done by the learner). In conclusion of our discussion of the two modes, I suggest that: Mode "A" represents the traditional conventional training mode and this mode still prevails in most of our training courses. Mode "B" on the other hand, appears to be the emerging pattern. It is now observable in some innovative projects. My commitment lies with this learning task centered, "B" mode; yet while making this commitment, I hasten to emphasize that I do not intend to promote a conflict between learning and instruction. The significance of instruction is not questioned here at all. The point that is made here is that the learning task is the nucleus around which to design instruction. The role and function of instruction should be viewed in its proper relationship to learning. It should be planned for and provided for accordingly. Instruction is a means to an end and not an end in itself. Its function is to facilitate learning. As you have considered the two modes, you have probably said to yourself: Wait a minute I Things are rarely such either-or, black or white, as suggested by the contrast. Of course you might be right. Many of us may operate in a mixed mode. I may have exaggerated the contrast, but I wanted to make it clear that the difference between the modes is crucial. We definitely have a choice. But what makes us operate in one mode or in the other? Why is it difficult for some of us to move into Column B, even though we wish to be there? What are some of the forces and influences which hinder this move? There are probably many. I'll propose a few. First and foremost. we are influenced by our conception of the learner. According to a still prevailing conception, the learner's mind is considered to be an empty container which has to be filled with knowledge. The trainer's job is to present knowledge. to pour it into the mind of the learner. The trainee is to receive and store the information presented. In order to be able to do so, he is expected to be attentive, to listen, and to take notes. In this mode, the trainee is just a receiver. This conception underlies the teaching-centered training mode and determines much of what goes on in our training courses today. But there is a new conception which seems to be emerging now and which becomes the basis of the learning-centered mode. The learner is now viewed as one who is seeking new knowledge and skill; he initiates and manipulates, rather than just receives or is Just manipulated. Discovery and inquiry appear to be the preferred ways of doing and learning. As a result, learning comes into focus and it becomes a self-generated, self-rewarding endeavor. The trainer s role becomes more that of a stage manager, rather than the actor on the scene. Learning is the key act and the learner becomes the actor. Wanting to act in Mode "B" is not enough. although it is the first crucial step. We have learned to realize that conducting a training event in Mode "B" requires a much more intensive and extensive staff preparation than our conventional way of doing training. The staff itself has to go through specific learning experiences in order to acquire competence to become guides and managers of learning, rather than actors on the instructional scene. A lack of staff involvement in the process of self-development for the new roles in the new mode is probably the most outstanding reason why we cannot operate in Mode "B" I know of programs where attempts were made to act in the new mode without, however, proper staff preparation. The results were disastrous. Next we are, of course, influenced by our own experiences. Most of us grew up in the Mode "A" type instructional environments and dreamed to cope with, and live by, this mode. As the majority mode is still "A", many of us find a certain security in going along with it. It often invites criticism or even ridicule if one acts in the "B" mode. Training is a process with a purpose. It is a process of the learner moving from a state wherein he cannot yet perform as the described purpose of the training to a state when he can demonstrate such performance. This move is what training is about. Training is the making of specific arrangements in the environment of the learner which provide him with experiences by which he can confront and master the learning task, by which he can be transformed to the state when he can perform as desired. It is probably the greatest challenge for us in training today to break the conventional training mode patterned according to the subject-centered, trainer-performer mode. and create a fresh mode in which learning tasks come into focus and the learner becomes the key performer. Written by Béla H. Bánáthy. 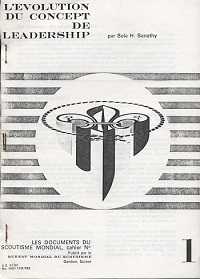 Originally published as “World Scouting Reference Papers, No. 1." by the Boy Scouts World Bureau, Geneva, Switzerland, May, 1969. Reprinted with permission of the author.